After much reading about all sorts of running matters online, one thing I stumbled across was Parkrun. Having gone close to completing a 5km run the previous week, I thought it could be something to aim towards. Unfortunately my commitments on Saturdays mean that I would rarely ever get to run Parkruns but it was still a distance to aim towards and something that I could do when the opportunity arose. At the time of writing, I am still yet to complete my first official Parkrun. 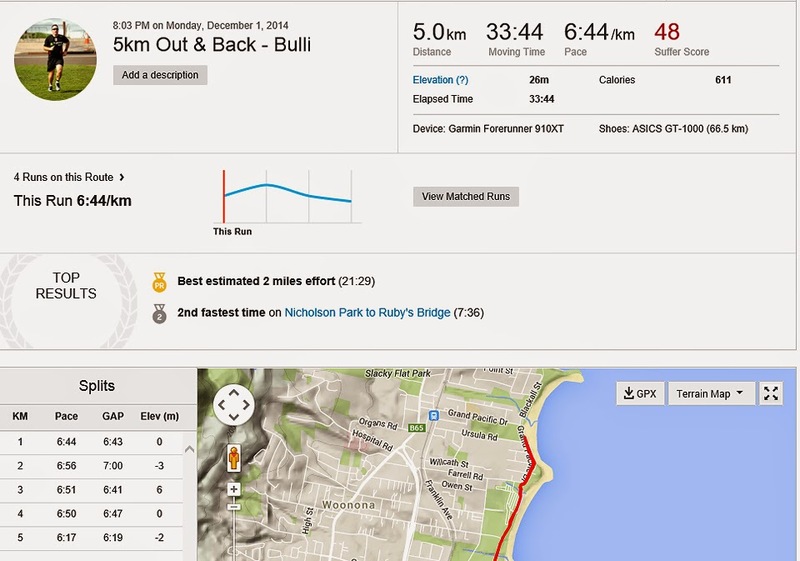 I have run my local course (Sandon Point) and logged a freedom run but have not had the chance to run with the group. It appears as though I will get the opportunity to make my Parkrun debut on Christmas Day of 2014. As fate would have it, there is three runs that week and I may be able to run in them all. Now that I knew roughly the distance I could aim for, maybe I could look for a training regime to fit that trip. However, to start the journey, I decided to run 5km on the first day of that week, just to give myself a gauge on where I was at. It may not have been the most wise way to start a 5km campaign but I think it was more a case of curiosity than anything else. The result was sluggish but had one positive, I managed to pace myself well enough that my last split was actually my fastest. History will show the overall time as 33:44, the first four splits were all within 12 seconds of each other with the final split being much quicker at 6:17. It was still not ideal but it was light years ahead of my prior crash and burn attitude. I went on to research 5km training plans and embarked on one immediately after that run.